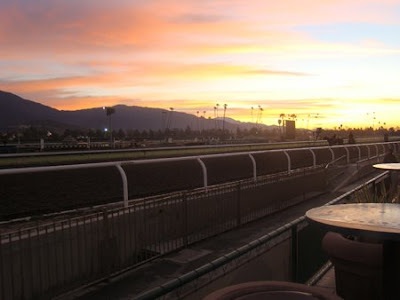 We left the house at 4:45 this morning in order to meet friends at 5:30 at the Santa Anita racetrack . Back that up, we woke up around 3 am. Ed's girlfriend likes to photograph the horses when they exercise at dawn, and we'd never been there at that hour and thought it sounded like fun. 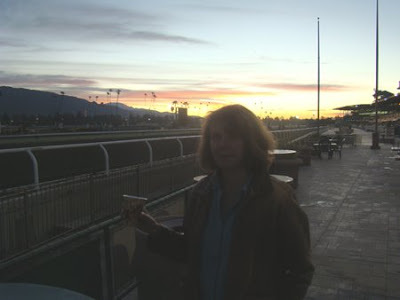 Back that up: I'd spent all afternoon at Santa Anita the day before with pal Linda P for the dollar beer and hot dog fun. And had lost every bet but managed to spot my favorite horse, The Pamplemousse, training incognito, and even spoke to his trainer,(!) and met the racing blogger who spotted The Pamplemousse as something special before anyone else had noticed. Breakfast at the Clocker's Corner (the pre-dawn spot to be), was incredibly delicious: a breakfast sandwich cooked to order by Rosie, with eggs and sausage and cheese on rye and really good coffee. Horses were speeding by in the dark, and jockeys we've seen in the races and on their tv show were standing in line behind us. Do I look a little "not quite waked up yet"? The cup had pictures of horses on it, but the flash was turned off. 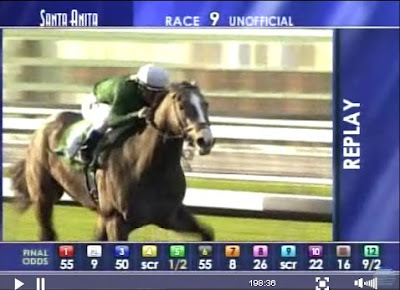 I got to watch the race anyway, on line The Pamplemousse won easily, amazing wondrous to see. 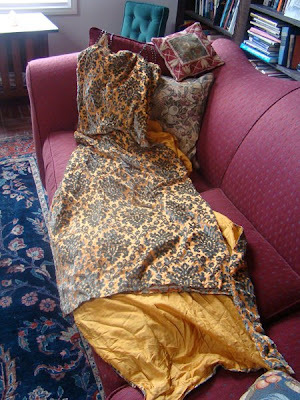 This is my grandmother's Mardi Gras gown from 1910. You can read more about it here. When I got it out of the box the colors seemed even more amazing. On the background of a vibrant orange is this dusky blue gray cut velvet pattern. It has rhinestone studded metal mesh straps and a fitted bodice. It's lined with a paler gold silk and has a long train with lead weights sewn inside the train. Unfortunately it's also about size 5. My grandmother was much smaller than me. You wonder what to do with family items like this. Just save it through the years? Supposedly it was a Worth gown from Paris. I have cousins who live in New Orleans and I told my brother I thought they should have it but he was against it. My niece lives a high style life and worked for Valentino for years. She might have an opportunity to wear a dress like this, but it wouldn't fit her either and she has three sons. It's in remarkably good condition. 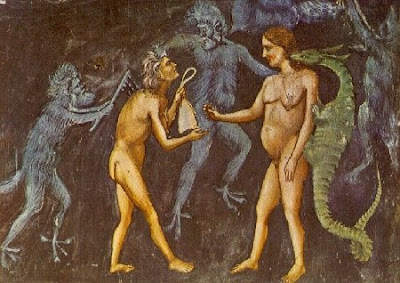 Detail of Giotto's depiction of Hell in his Last Judgment, the fresco he made in the Arena Chapel in Padua. I never liked Giotto in college and included him in a group that includes Cezanne, Reubens and others: artists I don't get or don't like. But this detail which I came across this morning is just beautiful, don't you think? I love the way the serpent is fastened onto her. I studied medieval art for two years: the professor really understood how to use the dark room and bright slides to transport you and make you love the work as he did. "The Knights of Momus" is also the name of the third-oldest New Orleans Mardi Gras krewe, founded in 1872. Unlike the Galveston Momus organization, the New Orleans iteration of the Knights of Momus has operated continuously since its founding, and remains true to its roots as a secret society. I don't understand why her husband's name isn't written anywhere. Family legend is that she led the ball that year, and that her gown came from Worth in Paris. 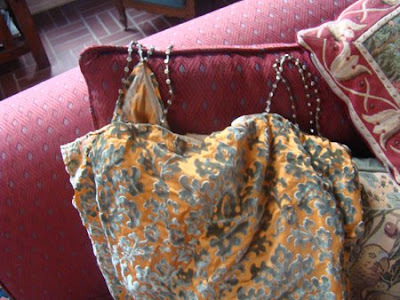 I still have the gown, and it is incredibly beautiful but doesn't have a label, maybe dresses didn't then. I was going to photograph it today but it's packed away, and by the time I had my mind on it, daylight was nearly gone. It's a cut velvet dress with a turquoise background and orange pattern, really wild and beautiful color combination. and yes we did watch the Academy Awards last night, drivel city. something weird's going on with blogger. Yesterday Namowal's blog was a blank page, and today mine is. Hoping that posting this will change things. I spent the afternoon at Santa Anita today, where admission was free and hot dogs, popcorn, and beer were one dollar. The weather was fine, and it was a great way to spend an afternoon. I think I came out ahead on my bets, but I wasn't inspired. On the left is a horse named The Pamplemousse, who's my choice for the Kentucky Derby, and I hope he makes it to the race. He's stabled at Santa Anita. He's an unusual color, called a gray roan, but actually sort of a lavender color. I wrote about him once before here. Look at his blaze, the white strip on his face, and compare it to the horse on the right, my first horse Luna, a great great horse. In that picture she was already past twenty. She was also a roan, which is defined by white hairs mixed with color hairs. She was half Thoroughbred and half Appaloosa. Can you see why I can't take my eyes off The Pamplemousse with that Luna blaze on his face? (It's an unusual marking.) His next big race is a week from tomorrow at Santa Anita. Guess where I'll be? Oh and this is a wall mural at the Santa Anita racetrack, right across from where you get the one dollar hot dogs on Fridays. Love the stripes on the cushions. Should have sat there to eat the hot dog instead of gobbling it on the escalator. For the first half of "Birdman of Alcatraz" I thought this was maybe the best movie I'd ever seen. The second half wasn't as moving. It was interesting how civilized jail life on the cell blocks was portrayed. Was it really like that? After seeing the movie I poked around facebook and made contact with friends from the past, saw friends of friends I also knew, even friends of friends I didn't want to know anymore. You can call out to them and make digital contact, but it's not the same as being in person, of course. It was as if friends from my past were in all these different little cells calling out to me, sort of. 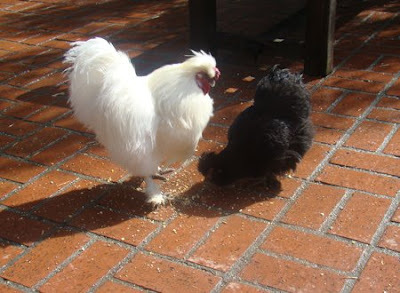 It's hard to get a picture of Elle the rooster and Star the black hen, together, because the contrasts of black and white couldn't be any greater. They are 8 years old! 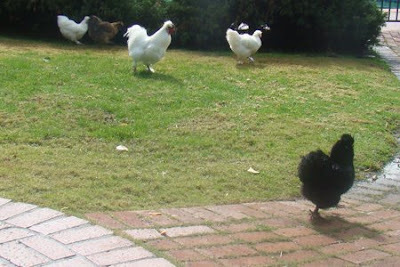 Don't they look gorgeous, in classic hen and rooster pose? He's pointing out the goodies for her to eat. It's what roosters do-- well one of the things they do! Here's the group, 4 girls and a guy. Everyone's related to everyone else. They were having a worm party right after the rain. I was thinking of giving this card away but I think I have to keep it. P.S. "Snozzy" is what I called Reddi-Wip when I was 3 or 4. I would use the can like a telephone, and speak into the bottom of it to talk to Mr. Snozzy. I nearly spilled coffee on the keyboard when I read that one. You're the person who animated this? Wow... thanks for the happy childhood memories! (In the song they sing "above, below it all" = "a bubbelow"! Don't you love it? It does sound like a name of an animal! Just got back from "Coraline". Saw it at a matinee at the Arclight in Sherman Oaks. $15.50 per ticket and the popcorn was $5.00 and had those nasty kernel flakes that hook onto the back of your tongue. And no Jujyfruits. The movie was in 3 D with must be returned polaroid glasses. The movie has plenty of good things about it: the animation and design of Coraline are very nice-- love her blue hair. And I even liked her voice. She sounds contemporary without sounding like a tv brat. I hated the 3 D. The glasses were dirty and the 3 D gave me a headache, maybe because one of my eyes is stronger than the other. Since I kept taking them off and on I can tell you not all the movie is in 3 D, but the parts that are look quite fuzzy with your glasses off. But they do allow you to fall asleep in the theatre without the person next to you noticing as long as you keep your mouth closed. Jeff Katzenberg wants all movies to be made in 3 D. I think that's a horrible idea. Something gross about putting these glasses on your head straight from someone's head at the previous show. I started tripping out thinking of the creepy things that could occur as a result. ...which shows the story didn't really grab me, and the story is full of concepts that would be terrifying to a young child in days gone by, some of which is apparent in the trailer. 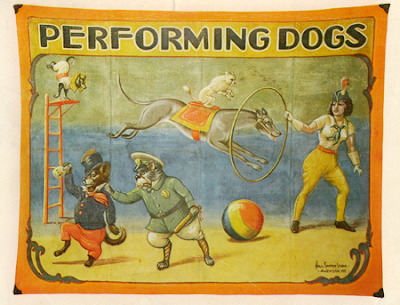 But none of the kids in the audience seemed troubled. I found the aesthetics alternately charming and icky. A pair of elderly ladies made me think of those repulsive ladies made of nylon stockings that were seen in gift stores a few years ago. 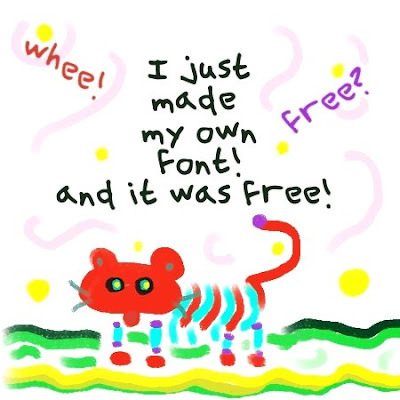 I found a nifty place where you can make your own font for free. It's very easy. You download a simple template and fill in the boxes, then scan it and upload it. They convert it to a font you then download and can install like any other font. It's hard to write by hand even with a Wacom tablet. I struggled with the print on the Valentine. If I'd known it was really going to work I'd have tried harder with my handwriting. Lots more useful free apps for designers here at smashingapps. Here's the pictorial instructions for printing the valentine I made for download. The basic instrux are on a postit on the pdf. Should look like this after folding is complete, with the slit as shown. You can use scissors easily I discovered, by folding on the center vertical fold, then cutting on the horizontal fold, if that makes sense. 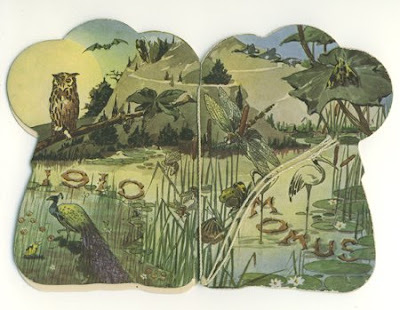 Here's the accordion fold above. The diamond pull out I tried to describe. Grabbing the diamond to make it a booklet. It only involved making one slice along a fold line and nice tight tight fingernail reinforced folds. I uploaded it here for anyone who wants to fold laundry, I mean valentines. 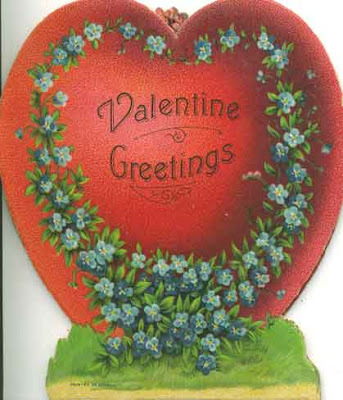 Generic enough that anyone will find it a peculiar Valentine and not be offended. If you like doing paper architecture like popups etc. I recommend you give it a try. There's something so amazing about the structure of it, with no staples. I put a pop up of instrux on the pdf, on how to fold it, but it gave me trouble describing the relatively simple fold and snip instructions. Let me know if you're lost and I'll post pictures of how to fold. wow! (doesn't look like much at outset, but let it play-- amazing.) if you roll over the image all the extra stuff goes away. Barbra Streisand bought our fish! All our koi (fish) were packed up and taken away a week ago. It was an awful emotional day, and I've felt sad about it ever since. But the cost of the pond maintenance is just nothing we can handle, and we're away so much that it adds to the troubles for a house sitter. But we've been through so much sturm and drang over the years with fish, and replacement fish, and frogs, and turtles. Once I took a turtle to the vet and they told me it was already dead. euhh. Once I went to a turtle fanciers meeting at the mall with Big Mama in a box. She was a survivor turtle we'd adopted, but she had started eating our koi. She'd been seized in a raid of illegal turtles headed for a restaurant. We found a new home for Big Mama at that mall. I bet she's still alive. We put the pond in right after the earthquake in 1994. At that time we each picked out a koi that was "our fish." 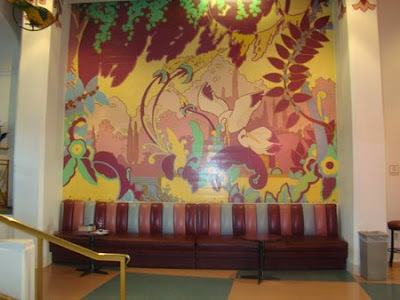 We thought Dinah's was particularly ugly, because it was beige white, and always referred to it as the naked fish. Now it will live with Barbra Streisand. The only fish in the original group that had survived, the naked fish grew to monster size and developed lovely silver blue scales. It sold for $750. Our pond maintenance pal has lots of celebrity clients. Celebrity fish. But koi are as unlikely a way to make money as investment horses. Along the way you will spend more than you will ever get back for them. Now investment chickens, that's a different story! Ann told me about this, that there's a show of Walker Evans' postcard collection now running at the Met in NYC. This card is a postcard Evans made of one of his photographs. It cheers me to read postcards are getting their due. I only have around 2000 of them! 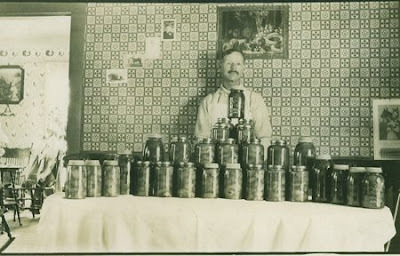 (give or take a few hundred.) The cards the Met chose to include on their website were a bit dull I thought, other than this one. You could sense from the write up that the curators weren't entirely comfortable discussing a postcard collection. Gee, and just after they had that big sale on Charbucks underwear. Check your labels, pals. Actually this is a wonderful createion from acapela tv. They also have a make it yourself cute cartoon feature which will entertain you greatly if you're the only one in the room. I'm so happy to find this stuff. Flash provides great scripting possibilities for interactive animation, but the scripting language got so complex that people don't use it for silly stuff very often. His name was Curtis and he was a history professor. His wife didn't like me. They lived in an immaculate house. "Would you like punch or coffee?" she asked me. He couldn't stop talking. He told me of his plan to write a novel about a pair of Siamese twins in the Civil War, with divided loyalties. "Stop talking and eat your cake," his wife told him. I had my own tv tray for the cake plate and punch cup. He showed me the books he'd written: books of inspirational sayings, historical books on the Confederates in Mexico, and joke books. He glowed. "You'll have to forgive me for talking so much, but I just have to tell you this. When I saw 'The Three Little Pigs' for the first time in a theatre, it was one of the thrills of my life." He was so round and shiny and full of good thoughts and things to say. Bill Irwin gives a thoughtful presentation on why artists should be hired to visit schools. The organization "National Campaign to Hire Artists to Work in Schools" has a group on Facebook too. I sent some of you invitations, but honestly I don't know what joining a group on Facebook does! A very nice stop motion video sent to me by Karl Cohen. They're Coming for Dinner-- AAH! 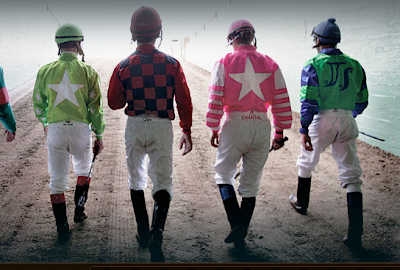 I was reading about the new reality tv show starting Friday night at 9 on Animal Planet: Jockeys all about a group of jockeys at Santa Anita. Consequently I had a nightmare in which they're all coming for dinner and there's not enough food. It's very real. Jon's saying "Why didn't you make more butternut squash?" Eek, why did I cook so little? But then I remember, in the dream, that jockeys have to keep their weight down, and besides, they'll probably be puking it all in the bathroom. Total logic in dreamland. They were all standing in a row at the front door when I opened it, the reverse of this picture. To try to get back to sleep I thought of who was in the dream and said their names to myself, a mixed up horse lover's version of the Mickey Mouse Club: "Chantal! Solis! Mike Smith!" Actually we're going to some friends' house for dinner tonight. Hope they're not in the midst of a nightmare about us right now! "Sally! Jon! Hungry!" All our family pictures are set to appear as a screen saver on this computer. Yours may be too. As they fly by I sometimes see pictures I don't remember ever taking, and trying to find them can be quite a task. 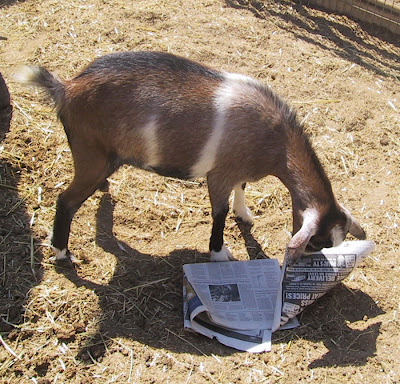 I saw this picture of Dinah's goat Margarethe reading the Los Angeles Times in 2003 and just had to track it down. Do you think she reads the San Francisco Chronicle now that she lives in Davis? Adjust the speed if you want. (Linda, I figured out how to embed graffiti in Blogger and not have it stick its big feet out the right side. It's just a slight adjustment to the html code and I mean slight.) 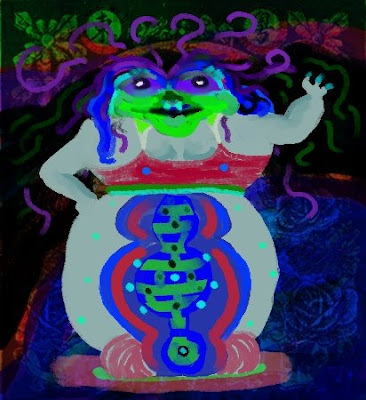 It's meant to illustrate an image that was troubling my mother below. My weekend visiting my mother had its wonderful moments and its terrors. The worst was the night I got there. After driving through rain that never quite froze (and I have an exaggerated fear of ice) I found my way to her hall. She was touring the hall with her walker, but when I came up to her she was terrified from a dream she was still inside of. She even turned to me and said, "Who am I?" Then I got the nurse, and a little dose of Ativan made her normal again. I think I could have used a dose too. My visit that night was short. How many days was I there? I think I caught a little of what the walking walkers all have. 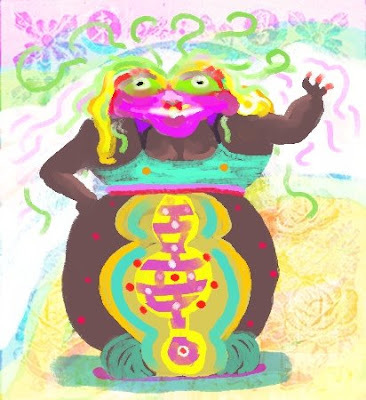 For much of the time my mother was lucid and we often were laughing hysterically. Now I can't remember what it was we were laughing about. I hope it will come back to me as my mind shakes off residuals of the old folks home. When she would get sleepy her paranoia would come on. I had to jiggle the conversation often so she wouldn't get into the thought ruts that lead to more trouble. On Friday morning early she had to go by medivan to the hospital where her leg had been worked on. It was only supposed to be a follow-up appointment, but she had to wait a long time. On her return she was obsessed with how scary the doctor's face had been. "Have you ever seen a mountain where all the trees have been taken down, and it's really flat, and then there are two eyes and this slit of a mouth, just looking at you?" That was the scary doctor's face, up really close to hers. I heard about this many times. That's what my graffiti pic here is meant to illustrate. On my flight back we had a male flight attendant who said really goofy and funny things, insulted many of the passengers, and told us George Bush was flying the plane. Then the captain came out, and he looked JUST LIKE George Bush. 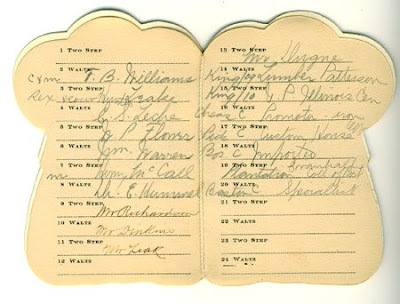 And the captain had a whole act he did too using the syntax and vocab old bully boy was used to using. I was crying it was so funny. Come to think of it, I was a loopy audience and might have been crying anyway!